Namaste! Welcome to Mango Mantras! This site is dedicated to my ongoing research of mantras, sounds, Vedic and Mayan knowledge. In here you will find many pieces of information and knowledge that pertains to an ancient civilization that once flourished the entire planet. Very little evidence has surfaced but through ancient scriptures like the Vedas and other scattered scriptures of other cultures, we will further our education and understanding of wisdom once available to the whole planet that used sound and mantras for creating a harmonious world. These scriptures which have endured many wars and colonization have survived and are still here today teaching us what was once established on this planet many many years ago. I am a firm believer of Vedic and Mayan knowledge and know that its powerful knowledge can help change the world and its level of consciousness. Through mantras, which is the recitation of the energetic sound/names of god/mathematical formulas, one can elevate and change themselves inside out. "If one knows the secrets of sound, one knows the secrets of the Universe........" -Nikola Tesla. 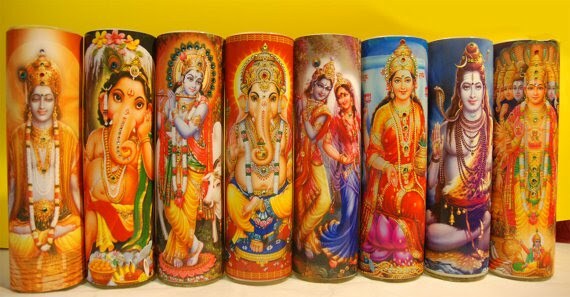 Through this creative process, I have created candles with a anthropomorphized deity, Hindu gods, that also come with a mantra that pertains to the deity/element/god/force of nature. I embellish them with the finest Swarovski crystals and a brief description and information of the mantra. They are perfect for meditation and a treat to see as the flame makes the swarovski crystals sparkle even more beautiful....Thank you for taking your time to explore my site. Blessings. My mantra candles are available on Etsy.com Thank You.